New York: Bantam Books, 1982. First edition of President Carter’s autobiography. Octavo, original cloth, illustrated. Signed by Jimmy Carter and Secretary of Defense Harold Brown on the title page. Brown was the U.S. Secretary of Defense from 1977 to 1981 in the cabinet Jimmy Carter. He had previously served in the John F. Kennedy and Lyndon Johnson administrations as Director of Defense Research and Engineering and Secretary of the Air Force. In the last stages of the Cold War, as Secretary of Defense, he set the groundwork for the Camp David accords. Near fine in a very good dust jacket. Rare and desirable signed by Carter and Brown. Jimmy Carters memoirs of life in the White House. "Seldom has a presidential memoir been so self-revealing" (Wall Street Journal). First edition. Octavo, original blue cloth. Fine in a near fine dust jacket. Signed by Jimmy Carter on the title page. First edition, later printing. Octavo, original cloth. 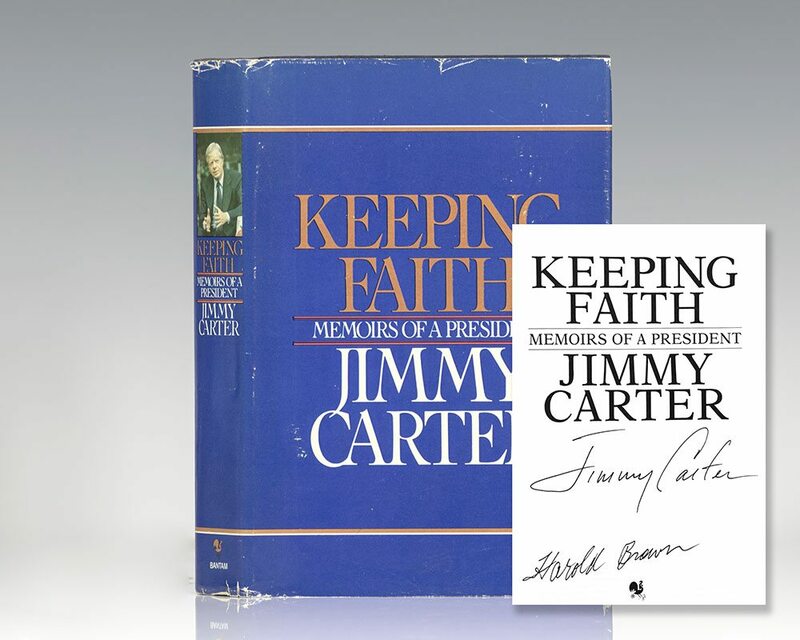 Signed by Jimmy Carter on the title page. Near fine in a very good dust jacket. Norwarlk, Connecticut: Easton Press, 1982. First edition of the signed limited edition, published by Easton Press. Octavo, original full gray leather, with titles to the spine in gilt and tooling to the front and rear panels, all edges gilt. In fine condition. Signed by Jimmy Carter. The Nobel Peace Prize Lecture.